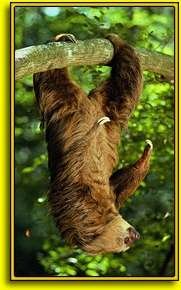 The three-toed sloth is almost totally arboreal ("tree-dwelling"), with a body "built to hang." It lives in the shrub or lower tree layer, but sometimes moves to the canopy. Its long, coarse, grayish-brown fur often appears greenish, not due to pigment but to algae growing on it. The sloth’s greenish color and its sluggish habits provide an effective camouflage: hanging quietly, the sloth resembles a bundle of leaves. Large curved claws help the sloth to keep a strong grip on tree branches. Considered by some to be a highly selective feeder, it was once thought to eat only leaves of the cecropia tree. Although cecropia leaves do make up the bulk of the sloth’s diet, more recent studies have shown that it also eats the leaves of many other tree species. The three-toed sloth spends nearly its entire life sleeping, feeding and moving around in trees, only descending to the base of the trunk every week or two to deposit dung pellets. It expends a lot of energy in this effort, descending from the tree, poking a hole with its stubby tail and then carefully burying its dung pellets. This "toilet" schedule helps this tree-dweller to conserve water, which, ironically, is not easy to get up in the trees. three-toed sloth The sloth sleeps soundly upside down for about 18 hours each day. It is protected by its high habitat and hanging posture from most predators. However, it is vulnerable to attacks by the Harpy eagle, especially when it basks in the sun at the end of branches. 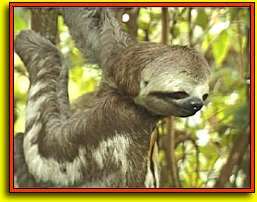 Though rarely seen, the sloth is probably one of the most common large animals in the New World tropics; however, populations are declining due to destruction of forest habitat.